<< Back DB Shoes. DAWSON. TAN. Sizes: 12. 13. 14. 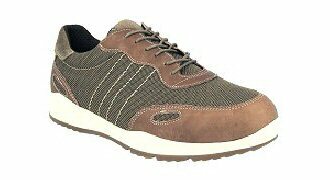 A sporty and supremely comfortable men's leisure shoe. flexible soft leather and fabric panels make these perfect for Spring wear. Whilst the Contrast stitching adds a stylish touch. A sporty look that`s perfect for casual days. Lace-up design that allows easy adjustment and a perfect firm fit that can be eased during the day if required for the most comfortable fit. Two removable "air comfort" cushioned insoles that can be removed to adjust the fit or to allow for the insertion of Orthotics.